Huawei Mate 9 Porsche Design Dual Sim offers a beautiful True Curve Design that draws its inspiration from the shape of the human hand. This amazing phone features an innovative combination of Gorilla Glas and a black brushed aluminum unibody. 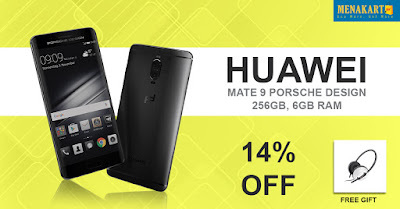 This incredible black Huawei Mate 9 Porsche Design Dual Sim is a visual treat for your eyes. Huawei Mate 9 Porsche Design comes with a First class customized leather smart flip-cover that gives you a glimpse of the important information on your phone and elegantly protects it from any falls. Huawei Mate 9 Porsche Design Dual Sim features a strong Kirin 960 Chipset paired with a huge 256 GB internal Flash-Memory and 6GB of RAM, this mind-blowing phone embodies the meaning of high-performance. All these features work hand in hand to guarantee smooth and effortless user experience on the newest Android 7.0 Nougat OS. This remarkable Huawei Mate 9 Porsche Design Dual Sim offers you dual SIM capabilities that are perfect for staying connected wherever in the world you may go. It also equips an amazing 5.5inch 2K Curved Crystal-clear display that will present all your pictures, applications and videos in inconceivable clarity. All these astonishing features are paired with a huge 4000mAh battery that can provide you with two full days of continuous use. This battery flaunts a lightning speed charging ability; in only half an hour, your phone will be set and ready to go with more than half the battery available for use. To seal it off, this Huawei Mate 9 Porsche Design Dual Sim offers your data and information maximum security with a fingerprint sensor. Huawei Mate 9 Porsche Design Dual Sim equips the pioneering 2nd Generation Leica Dual Camera which guarantees sharp and colorful pictures. This unique Leica Summarit dual-lens technology provides you with a 12MP RGB camera and a 20MP monochrome camera. This technology is paired with the innovative Hybrid Zoom technology that picks up and enhances even the smallest of details to provide you with remarkable pictures and memories that will last a lifetime.